· ✔ RESERVED WITH PLENTY OF SPACE: Easily fit your FPV and neatly tuck away all the wires. · ✔ EQUIPPED WITH RUBBER DAMPER: with AV shockproof ball, high quality and strong ability of shock absorption. · ✔ SUPER STRONG & SMOOTH FLIGHT: 1.5mm full carbon fiber fuselage and 3mm machine arms effectively reduce vibration during flight, guaranteeing the flying ability of the quad copter. Solid sturdy tough complete kit. The frame came very well packaged and went together easily. Compact design with small numbers of components, can be easily assembled. Suitable for 250mm. 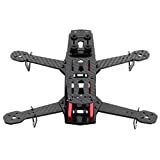 · ✔ WHAT YOU GET: LC Prime 1 X Mini 250 FPV quad copter Frame. And our 60-day warranty and friendly customer service. Great choice for Prime Day & Gift idea. · LC Prime Carbon Fiber DIY Quadcopter Quad Race Copter Frame Kit 250 FPV Race Drone Sport Recommended Configuration for this Frame (Not included): 1. Motor: 2208/1800 kv. 2. Propeller: GemFan 5x3. 3. Battery: 3S 11.1v1500mah. 4. Flight Controller: FPV Manuals CC3D, RMRC CC3D, Naze32, Flip Pro MWC. 5. Receiver: FrSky T6 receiver. 6. CCD Camera: SONY Super HAD CCD 600 TVL Board Camera/2.8 mm lens Settings to use on camera. 7. HD Camera: Mobius Action Camera. 8. Video Transmitter: Immersion RC 600 mw Video Transmitter. 9. Antenna: Immersion RC Spiro Net V2 (SMA). Specifications: Material: carbon fiber Weight: 141 g Shipping weight: 161 g Package Included: 1 X Mini 250 FPV quad copter Frame. About the Brand:1. LC Prime is a registered trademark in EU (Reg. No. 014136089) and LC Prime (EU) is the only authorized seller of LC Prime branded products.2. LC Prime devotes to offer various EXCITING items around the world to delight you. TURN ON YOUR LIFE by bringing more convenience, colour and novelty.3. Product perfection is our ultimate goal. Your opinion is our improvement, feel free to contact us for any problems.